In the new navigation tabs, there are several customizeable options. However, regardless of the level of customization, when I click "Questions" it no longer returns to the selected tab I was on. It used to, but no longer. Perhaps there are too many options to figure out what was last used, and so it defaults to just creating a new tab "newest*". While I understand the historical precedence of showing newest by default, I also in this age of customization want to dictate that default. When clicking "Questions" instead of returning to a new "newest*" tab, I would like to return to the selected "default" tab. 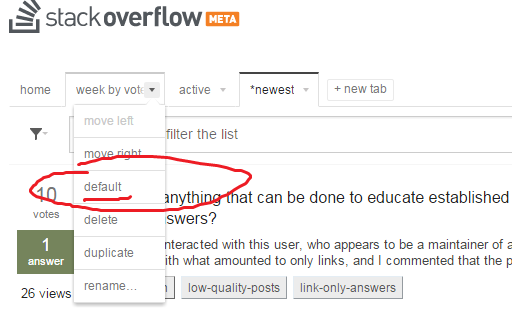 Browse other questions tagged feature-request new-nav .